MACS technique enables the immunomagnetic separation of healthy spermatozoa apt for the fertilization from apoptotic spermatozoa which have less possibilities of survival. This technique is aimed to be used in IUI treatments, as well as in IVF or IVF-ICSI cycles. The apoptosis, also known as programmed cell death, is a regulation process of the cell cycle. It may occur during the spermatogenesis if cell damages such as DNA sperm fragmentation appear. Several case studies on infertile patients show that there is a high level of apoptotic spermatozoa found in an ejaculate. This means that the auto regulation process has failed or that there was a high level of damaged cells. This may be due to either inherent or external factors such as smoking, stress, fever, varicocele, etc. 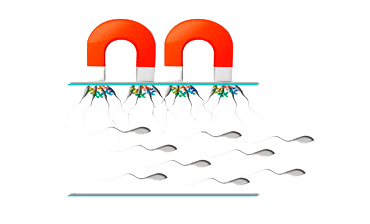 This technique is based on the use of magnetic microspheres that have specific antibodies attached which are able to detect several markers located on the sperm membrane, such as the externalization of phosphatidylserine. The antibodies which are attached to the microspheres detect this marker when the spermatozoa are exposed to a magnetic field and retain only the damaged sperm (those with the marker). When is this technique indicated? Patients having undergone more than 2 cycles without achieving pregnancy. IMSI may be a complement to MACS in cases of severe male infertility. MACS is a technique that selects sperm that do not have a special marker indicating it might have an alteration. IMSI enables us to choose the best sperm for the fertilization, from a morphological point of view.